(Get/GetNext/Set/GetBulk operations) specified in the SNMP protocol. The SimpleTester™ is the industry leading SNMP test tool that automatically exercises SNMP v1, v2C, and v3 agents. All types of SNMP Agents (standalone, proxies, sub-agents) implementing one or more standard, experimental or private MIBs can be exhaustively tested, within minutes. As the number of MIBs, MIB variables and instances supported by an SNMP agent grows, it can take weeks or even months to manually test each variable using tools like a typical MIB Browser. This is where the SimpleTester is most useful. The SimpleTester is an "SNMP Expert" program that will intelligently interpret MIB files, SNMP protocol specifications, and all the MIB objects supported by the agent. Using this knowledge, it automates the testing process to complete weeks worth of manual testing - in just minutes. The SimpleTester contains syntax tests, semantic tests, performance tests, and other utilities. The predefined syntax tests check for MIB and SNMP protocol compliance for any MIB by sending hundreds of different Get/GetNext/Set/GetBulk requests and analyzing the response for each and every MIB object supported by the agent. With each test result, reference is given to the RFC which specifies the behavior being tested. The semantic tests include over 1100 tests to validate the semantics of popular MIBs like MIB-II, RMON, SNMPv3, and the NTCIP Global Objects MIB. These tests further ensure that the agent has implemented the behavior of each MIB object properly. For example, in MIB-II if 2000 octets are sent to the agent, its ifInOctets for the corresponding interface should at least increment by that amount. The tests can be easily customized by making changes to configuration files. In addition, the source code of all the 1100+ tcl scripts is also available for perusal. The framework is also fully documented to allow users to easily add their own test suites. The performance tests measure the agent's ability to handle a stream of requests, one after another, and its ability to handle a set of requests all at once. With these tests the SimpleTester is measuring response times and creates a report which indicates the shortest, the longest, and the average response time given the number of messages sent and received. The test suite structure support is fully extensible. Users can develop and add their own semantic test suites using the test suite builder which has a very easy to use graphical user interface. The built-in Tcl interpretor has support for SNMP, Telnet, Serial I/O, as well as the Simple Transportation Management Protocol (STMP), to allow users to define their own scripts that test other aspects of the device including its Command Line Interface (CLI). The SimpleTester includes a MIB Browser that graphically displays the object registration tree and allows the retrieval and setting of manageable objects. In addition to the user interface, the SimpleTester can also be run in an unattended mode by specifying the tests to be conducted in a command file. SimpleTester also includes support for Diffie-Hellman Key Change and Key Ignition. Ability to create random numbers and their corresponding keys is also available. This functionality is particularly useful within the Cable Modem industry implementing the DOCSIS 1.1 specifications. Use the built-in MIB compiler to load the MIBs supported by the Agent. Use the built-in MIB walker to specify the variables to be tested. Run any or all of the predefined tests to check for conformance with the MIB definitions and SNMP specifications. The detailed reports pinpoint problem areas. Use the built-in Script Generator and RowStatus Tester to automatically create test scripts and the built-in Script Runner to run these scripts for load and regression testing. Optionally use the built-in Semantics checker to check the implementation of popular MIBs. Reduced development, testing and support costs by detection of errors before deployment. Communicates through both UDP datagrams and TCP connections over the standard network interface. Checks MIBs (v1 and v2 SMI) for Syntax Errors. Checks agent responses (and traps) for conformance with the associated MIBs. Automatically tests each MIB variable for get, getnext, getbulk and set operations. Supports the Posix test results as defined in IEEE std 2003-1997. Includes over 1100 semantic tests for popular MIBs like MIB-II, RMON and SNMPv3 with source code. Creates script files to be used for regression, load and "RowStatus" related testing. Provides detailed reports that pinpoint problems. Includes Tcl interpreter and SNMP, Telnet, Serial I/O, STMP Tcl commands for custom script development. Contains a simple MIB Browser that graphically displays the MIB structure. Supports MD5, SHA, DES, for standard SNMPv3 authentication and privacy. Support for 3DES, as well as AES with 128, 192, and 256 key lengths, only available with AES version. Support for SHA2 with key lengths of 128 (uses SHA-224), 192 (uses SHA-256), 256 (uses SHA-384), and 384 (uses SHA-512), only available with AES version. Includes support for Diffie-Hellman Key Change and Key Ignition. Supports functionality to include user defined test suites. Supports both hardware andsoftware based licensing schemes. Includes the ASN.1 version of the NTCIP MIBs and also precompiled files of all those MIBs so that all that will need to be done is to add a device's manufacturer specific MIBs to the compile file. Standard IETF MIBs, Experimental MIBs, or Proprietary MIBs. 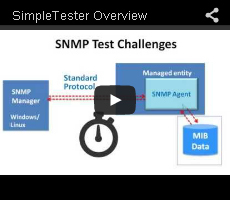 SimpleSoft provides a whole family of SNMP Agent testers to ensure that as your agent complexity and testing requirements grow, SimpleTester solutions grow with it. The smooth upgrade path also minimizes the need for retraining and learning a new and different test tools. As your test environment grows, individual testers familiar with SimpleTester will find it straight-forward to migrate to the SimpleTesterPro and carry out additional vulnerability testing. Test departments with many test engineers can migrate to using the floating license to carry out SNMP testing, by using a license server-based solution. SimpleTester Family Feature Comparisons provides a tabulated description of the features available in SimpleTester and SimpleTesterPro. More than 250 networking companies including CableLabs, Cisco, Nortel, Lucent, 3Com, Alcatel, Nokia, HP, TI, Fujitsu, Ericsson, and Deutsche Telekom. Back in 1994, some of the openly available ISODE 8.0/SNMPv2 software distributions included a number of Tcl based test scripts to check for SNMP MIB and protocol compliance. But the process of getting the dependent software packages (BLT,ISODE, Tcl/Tk) and compiling them was fairly long and cumbersome and required gigabytes of space as well as a good understanding of the UNIX operating system. The test suite was also only available on UNIX. Realizing the ubiquity of PCs, SimpleSoft created the first commercially available Microsoft Windows 3.1 based automated SNMP agent tester (SimpleTester). It was written in C, easy to use, and included some of the tests in the openly available package augmented with script generation and trap checking capabilities. The shrink-wrap product required only a few megabytes of space and could be used out-of-the-box. This made the test engineers productive very quickly without requiring them to be UNIX gurus. SimpleTester's ease of use soon made it a popular SNMP tester on hundreds of PCs in testing labs all around the world and its popularity continues to grow with every passing day.